Ascot Villa in Sheringham, Norfolk sleeps 8 people. Ascot Villa in Sheringham is set on a quiet road, but is still very close to the town centre and wide beach; Ascot Villa has been lovingly renovated and redesigned by the owner to provide everything a discerning guest could need for an enjoyable holiday. 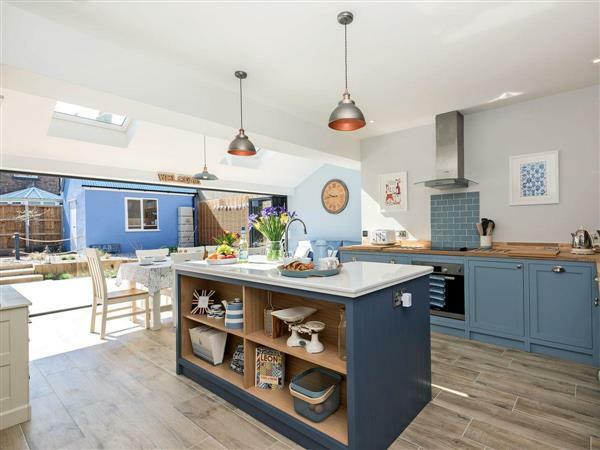 This detached property boasts a spacious, light and airy kitchen with a large dining area, where bi-fold doors lead out to the private courtyard garden. Whether you choose to unwind over dinner or by the wood burner in the living room, you will find Ascot Villa a very relaxing getaway. There are four bedrooms and three bathrooms for your comfort, and every care has been taken to provide beautifully decorated, high standard accommodation throughout. A few steps will take you to the wide, sand and pebble beach, a favourite with locals and visitors alike, and some of the rooms enjoy sea views. You are also close to the town centre which has a good mix of artisan and high street shops, and lots of great places to eat and drink. The town is also home to Sheringham Park, 1000 acres of landscaped parkland and gardens with breathtaking coastal walks, The North Norfolk Railway, with steam train trips along the coast, and two museums, including the quaint Peter Coke Shell Gallery. Those tempted to venture further afield can head east or west to find a string of pretty coastal towns and villages including Cromer, with its famous pier and cinema, and Wells-next-the-Sea with its much photographed quay. You will also find The Thursford Collection with its famous Christmas Spectacular and Santa’s Magical Journey, Cotebrook Shire Horse Centre, Amazona Zoo and The Muckleburgh Military Collection close by. In fact, you will be spoilt for choice as this part of the coast offers something for all ages and all tastes, including lots of walks, cycle routes and bird watching. And, to return to Ascot Villa after a day’s sightseeing, now that is a treat indeed. The beach is 100 yards from Ascot Villa in Sheringham. With the shop 200 yards, and the pub & restaurant are 100 yards from Ascot Villa. Living room: With wood burner, 49 Freeview TV with Netflix, DVD player and wooden floor. Kitchen/dining room: With electric oven, electric hob, microwave, fridge/freezer, dishwasher, tiled floor and bi-fold doors leading to garden. Utility room: With wine cooler, washing machine and tumble dryer. Gas underfloor central heating, electricity, bed linen, towels and Wi-Fi included. Initial logs for wood burner included. Welcome pack. Enclosed garden with sitting-out area, garden furniture and barbecue. Private parking for 2 cars. No smoking. Please note: No children under 5 years old. Holidays at Ascot Villa run from Friday to Friday. For a better idea of where Ascot Villa is, you can see Ascot Villa on the map below. Ascot Villa is in Norfolk; should you be on the lookout for a special offer, you can find all the special offers in Norfolk. It's always worth checking to see what is on offer at the moment. Do you want to holiday near Ascot Villa (UKC3275), you can see other cottages within 25 miles of Ascot Villa; have a look to find your perfect holiday location.